• The SS10 collection for Loden Dager includes two great organic cotton suits! You'll be able to get them at Opening Ceremony. These casual blue and gray suits are great for warm weather with a tee shirt, or layered-up for cooler weather. No ties required! • Would you eat lab-grown meat? I'm happy with my seitan, but some argue that with lab-grown meat, no one gets hurt! What do you think? Is growing flesh with no immune system safe? Is it any more "natural" than the genetic freaks we have crated where 99% of meat comes from, as it is? Read the article at Guardian and tell us your thoughts. Environmental solution or sci-fi nightmare? 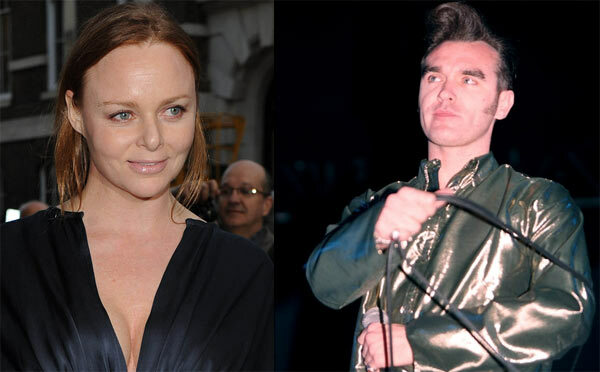 • Rumor has it, that the legendary Stella McCartney and the legendary Morrissey are teaming up on some vegan shoes for men. They will probably cost an arm and a leg, but not from our animal friends. Read the full article at Ecorazzi.